MISSION, KS--(Marketwire - October 25, 2010) - (Family Features) Fifty-six percent of Americans eat three or more snacks per day, according to the United States Department of Agriculture's "What We Eat in America" 2007-2008 study. Snacking sensibly while trying to balance work, the kids' after-school activities and the season's get-togethers, however, is not easy. One way to help control appetites and feel energized is to enjoy nutritious snacks. This is especially important when eating on the go or gearing up for holiday parties. So the next time that afternoon hunger pang rolls around, munch on these simple tips and delicious recipes. Combine mixture ingredients in a bowl. 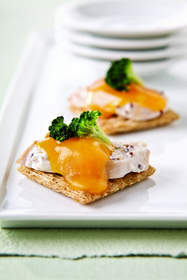 Place crackers on a baking sheet and top with the chicken mixture, adding one cheddar cheese slice and one broccoli floret to each cracker. Bake at 350°F until the cheese melts. Mix first 6 ingredients together in a bowl. Spoon 1 tablespoon mixture onto each slice of bread. Layer one thin slice of cheddar cheese and pear per cracker. Top each cracker with a touch of mustard, using 2 teaspoons total. When packing a lunch, consider bringing along whole-grain pretzels to dip in mustard for a low-fat snack. One teaspoon or one serving of Grey Poupon Dijon Mustard has 5 calories. For variety, try dipping carrots, celery sticks or fruit slices in mustard, offering a satisfying sweet and spicy flavor combination that can be enjoyed at the office or at school any day of the week. Vegetables and honey mustard are low calorie and keep hunger at bay in between meals. For more recipe ideas and tips for healthy lifestyles, visit www.kraftfoods.com and click the healthy living tab.